TGI Fridays is leaving Lincoln. The chain cited the (not yet begun) O Street widening project as the reason for their closure. A friend and I recently tried out Lincoln’s newest Thai restaurant twice over the course of two weeks. Based on those experiences, I’ve written up a Blue Orchid review. This morning during my weekly walk near Beal Slough I noticed that a few trees were already starting to bud out, and that a few plants and grasses were already trying to green up. And then, not five minutes ago, it hailed. What month is it again? 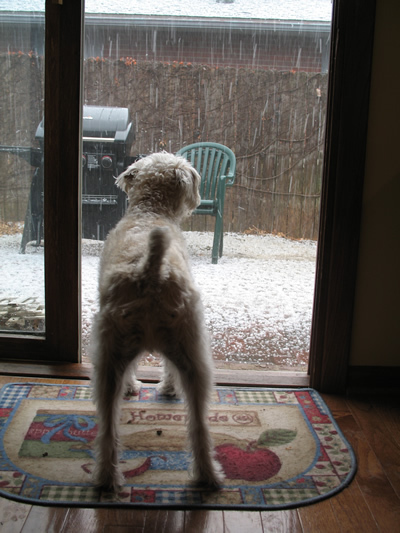 Daisy watches the hail fall. 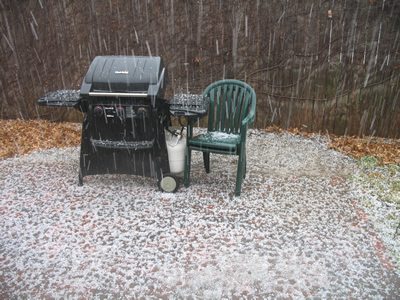 Our patio, all covered in hail. I suppose if we don't get any snow, we'll have to resort to throwing this stuff around. I’ve talked about it for a while, but I’ve finally posted my Scrumpy Jacks review. Lincoln is looking at a budget gap of anywhere from $6.8 million to $9 million this year. Where do you think Lincoln ought to round up the cash to cover the gap? My first post after a looong vacation: I was pleased to see that today, Friday, January 6, 2006, a new grocery store opened in place of where the old Klein’s Grocery was. They don’t have much in stock at all yet, but I am really glad a new store has opened there, and it is nicer than the old Klein’s too. I also spotted the county attorney there checking out the meat section as well. I’ve been saying that the Events section would go live “soon” for quite a while now. Obviously “soon” has come and gone several times. Not five minutes ago I finally had a breakthrough with some of the scripting I’ve been working on. I can finally move forward on making the Events section look pretty (or something approximating pretty), and then I’ll be able to open it up. There won’t be many, if any, events pre-entered, but that’ll change as I get Lincolnite closer to being finished. For now there will at least be a form for Lincolnite.com members to enter events, so if you want to promote yourself, your business, or your organization, you’ll be able to do so. I’m glad to finally be close to getting the Events section checked off my to-do list. Next up is the Classifieds section. That one’ll keep me occupied for a while, for sure.